NIA-CHARLESTOWN NEVIS (April 15, 2011) — The St. Kitts-Nevis-Anguilla National Bank Limited was showered with praise when Minister in the Nevis Island Administration (NIA) Hon. Robelto Hector delivered remarks on behalf of Premier of Nevis and Minister of Finance Hon. Joseph Parry, his colleagues and the people of Nevis at the Bank’s 40th Anniversary Banquet. The momentous occasion was held at the Royal Ballroom of the St. Kitts Marriott Resort and Casino on April 9th, a premier event on the Bank’s calendar of celebrations under the theme “Vision, Resilience, Stability…Hallmark of Our Journey” to mark its achievements over the past 40 years. Mr. Hector said the Bank had been an important partner to the Government and people of Nevis and described it as one that had become a national signpost and signature financial institution that had become a truly indigenous bank and a beacon of sound sensible and secure management. “In 1983 when the Nevis Island Administration was birthed, National Bank was there almost like a forerunner to give the Administration its first overdraft. Since that, the public /private partnership has yielded many a benefit to the Bank. “We hope but more so, we can say to the good people of Nevis that, [that] partnership was laid more urgent and earnest during the last two years of the global economic and financial crisis and for Nevis, [during] the 24-month closure of its flagship hotel the Four Seasons Resort,” he said. Mr. Hector told those present that the Bank armed with the knowledge of the psyche of the people of Nevis and their politics became a pillar of support and an oasis in a tundra-dry financial desert. 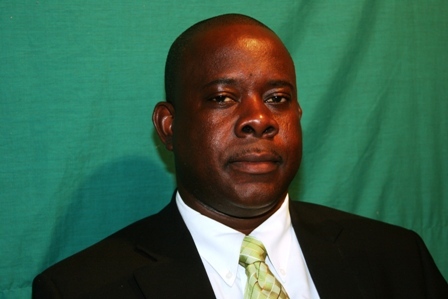 “On behalf of the Minister of Finance and the good people of Nevis we say thank you. “When therefore the Nevis Island Administration Government borrows from National, we use the same mantra that every pastor must christen his own child first. We are therefore, happy to pay National Bank first sure in the knowledge that when we do so we have paid ourselves first,” he said. The NIA Minister pointed to the bank’s many achievements which he believed reflected that of the people and nationals but reminded of the importance of continued upward growth. “We must not rest on our laurels, we must struggle ever onwards until we reach utopia. These celebrations then are to inspire a new generation of visionaries blessed with integrity, knowledge and a burning desire to write their names of history’s page. “They tell us that there is a sign over the door of heaven marks ‘home sab’ which begin interpreted means ‘well done’,” he said. Among those at the Banquet were St. Kitts and Nevis Governor General His Excellency Sir Cuthbert Sebastian and Prime Minster Hon. Dr. Denzil L. Douglas.